Starting a business can sometimes be risky, but it is certainly a huge commitment for anyone courageous enough to step out on that limb. However, having the necessary information and paperwork in order, helps to alleviate many anxieties and many stalled attempts at progress. Using a new company setup checklist will allow its user to take advantage of the wisdom of other business owners. This form, also allows for the new entrepreneur to start thinking about and researching the type of business that they want to be listed as. This is an area that many new entrepreneurs may not realize needs to be legally specified. This checklist will help to get any entrepreneur started on the road to opportunity; a real chance to take their idea, develop it into a concept, do the footwork to make it a legitimate business, and then to develop a brand. This template is a customizable checklist of the type of information that is pertinent to anyone who is looking to start a business. 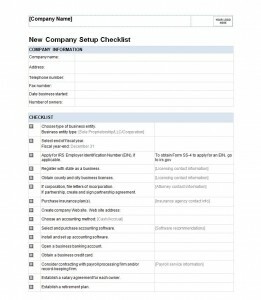 The new company setup checklist can be downloaded for free and is easy to use. The top of the form allows for its user to insert the company’s personal information. Such as, its name, telephone/fax numbers and the number of owners. The bottom portion of the form outlines the necessary procedures, forms, and steps that will be necessary to ensure that the business starts off on the right foot. Having all of this information on one sheet will help any new entrepreneur feel more proficient and capable of achieving a measured level of success. Once a task is completed or a contact followed up on, the progress can be documented right on the form. This form can also be used by financial professionals, they can write down the contact information of recommended professionals for certain items listed on the lower portion of the checklist. The checklist user can write down helpful details about each item on the checklist right of the form; such as, recommended attorneys, insurance, etc. If there is more than one owner of the new company, then the form provides the same information for all the parties involved. It allows for ease in communication between the owners. Because the information is easily accessible, any of the interested parties can follow-up on a task. The new company setup checklist can be scanned into any laptop or smartphone, so that information is accessible on the go.